*Add Cartridge set for 4 Blue Chamber System? 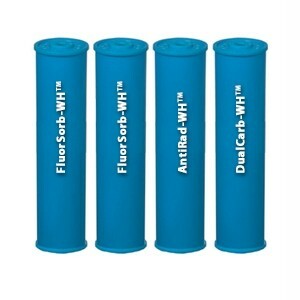 This is the complete replacement cartridge set for our PureEffect ULTRA-WH-C System. It may also be used in your existing filtration systems where the internal chamber diameter is 4.5" and the length is 20". Please ensure cartridges are always installed according to Instructions. For top performance, we recommend to replace these cartridges every 8 months for family of 1-3, every 6 months for family of 4-5.